Yoga is an ancient practice with origins stretching back thousands of years in India. It is designed to help achieve a more positive outlook on life and a focused, permanent sense of serenity and peace. The word yoga itself means union and union with the divine; however, many people have stripped away the spirituality and focus of yoga, so that most think of it as a group of intensely athletic people putting their legs behind their heads and curling up into jaw-dropping positions. People of all shapes, sizes, ages and abilities can do yoga and adapt it to suit their individual tastes and needs. First of all, and most obviously, yoga is an exceptional workout for your body. You can adjust the practices to your own speed, ability and level of comfort. No matter which yoga exercises you choose, the practices will always be part of a great workout routine. There are some fantastic yoga movements and poses out there that are perfect for every kind of day and for every kind of person, meaning there’s no reason to not start doing some yoga as soon as you can. Yoga stretches and exercises are designed around the idea of moving your body to increase its strength and durability. Therefore, practicing yoga on a regular basis will truly allow you to be much more in tune with your body, so that you will know when something is working appropriately and when it is not. A big part of yoga is the breathing exercises–or the pranayama–which are incorporated into positions and then on their own. The exercises encourage a more focused and centered way of breathing, and, while they might not be something you will do consciously every day, they are absolutely sure to provide methods of effective stress management, and will generally make you feel much better. Plus, anyone with asthma will find that it really helps to open your lungs and explore what it means to breathe consciously. (Take it from me; I know). Another minor, but pleasant, benefit is that practicing yoga can actually help you sleep better. This might be due to the fact that a few sequences of poses and movements are intended to be done right before sleep. But, studies have shown that doing some light physical activity before our heads hit the pillow can help us drift off to sleep more quickly. This usually leads to a much better quality of sleep. Yoga is also effective at helping to develop some premium, proper posture, since a lot of the breathing and seated positions require a straight back for proper effect. Many people who practice yoga notice another positive side effect: It helps to develop some truly incredible mental and physical strength. The whole point of yoga is to work on your body’s strength so that you can sit for longer in meditation, and the physical investment in the stretches and positions ensures that you will experience plenty of physical strength benefits as a result. The breathing exercises can improve your lung capacity, and lunges and stretches can increase your core strength as well as every muscle you can think of. Meanwhile, the exercises force you to focus on the moment, and during meditation, to clear your mind, which helps alleviate stress and ultimate it will improve your mental health. Meditation, meditation, meditation. It is really the key to all things yoga. Even if you can do every kind of complicated pose under the sun, it loses all of its true meaning if it is not done with focus and thought. Meditation has been shown time and time again to be a beneficial practice that everyone should implement into their daily routine. Natalie grew up in Prospect, CT where she started playing sports at the young age of 4 and continued playing throughout her life, including paying softball and volleyball for both travel and high school teams. At Menlo College in California, she continued with her love of sports by playing softball at the university level. Her passion for athletics inspired her to pursue a career in sports performance and Exercise Science, completely changing her career path from her original Sports Broadcasting major. She realized she was no longer interested in reporting about athletics, but rather, she wanted to be hands-on, helping others. Natalie’s ultimate goal is to inspire others to develop a passion for health and fitness, and to assist them in reaching their goals as their best self. She has specifically developed a profound interest in agility training and assisting athletes become more explosive. 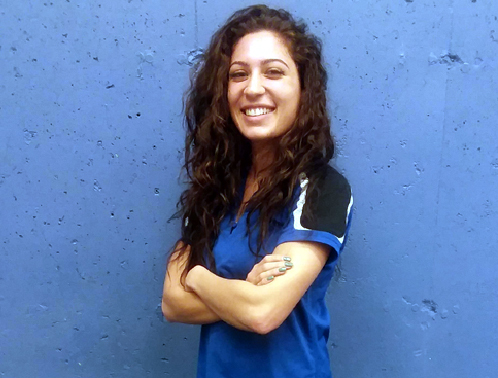 Natalie is a W.I.T.-certified personal trainer. She is also a student at Central Connecticut State University, and is scheduled to graduate with a degree in Exercise Science, and a minor in Mass Media Communications. Furthermore, Natalie plans to continue her education to become a yoga instructor, so that she can also aid in the recovery of athletics. No Comments to "Why You Should Start Practicing Yoga"